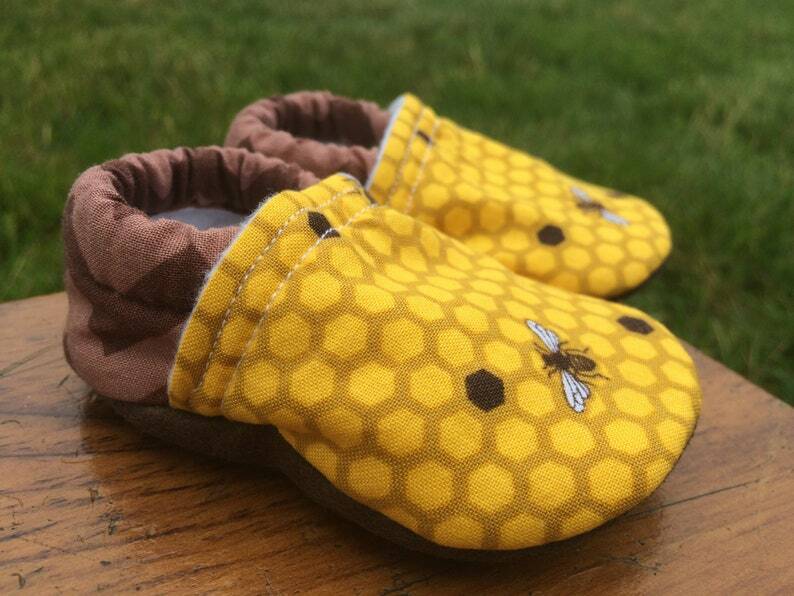 Perfect for that nature-loving family, these shoes feature our planet's precious, endangered honeybees! They are made from 100% cotton fabric, are lined with fleece*, and come with soles of your choice (i.e. either non-slip or soft faux-suede). They will keep baby's feet warm and cozy, and the elastic around the ankle will ensure that they aren't kicked off! Just perfect! These baby shoes are great, very well made, and are quite robust (the last one lasted 10 months and my child is not the quiet type! ), especially with the reinforced toes. I choose the non-slip fabric, which is perfect as my son walks. And easy to maintain clean, contrary to leather. Thank you very much for your care (lovely packed) and quickness!